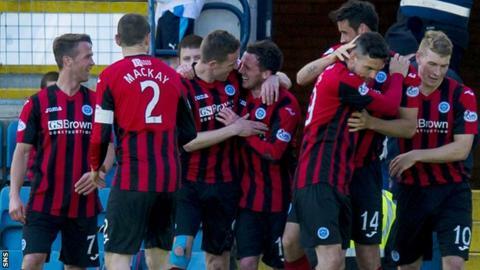 Dundee manager Paul Hartley described the defeat by St Johnstone as their worst performance of the season. St Johnstone moved above Dundee United into fourth place through Danny Swanson's opener and an own goal from Iain Davidson, with PFA Scotland player of the year nominee Greg Stewart sent off for the hosts. Dundee's hopes of securing a Europa League spot now look slim, with seven points separating them and Saints. "From start to finish we weren't at it today," Hartley told BBC Scotland. "I thought it was our worst performance in terms of how we played, the intensity, our tempo and how we passed the ball. "You've got to give St Johnstone credit, they played well, but it wasn't a good day we had. We looked really tired, maybe the game in midweek [2-1 defeat by Celtic] took it out of us a little. "It just didn't happen for us today, we were poor for the full game, which is unlike us. We've been really good this season but we just looked really leggy today. "It looks more and more difficult now [finishing fourth] but we've got to try and keep hoping and then try and get as many points as we can, but today's performance was not acceptable on our part." St Johnstone manager Tommy Wright was pleased with the impact of Swanson, who scored the opener before David Wotherspoon's shot deflected off Davidson to make it 2-0. "Danny will probably admit he's not been match fit and it's taken him a while to settle," said Wright. "He had a good chance in the first half over the bar, he loves coming in off the line and pulling the trigger with that right foot. "So it's a great goal, I'm really pleased for him and he worked his shift. He was apologising coming off how tired he was but that shows the effort he put in as well."